Posted in: kingpin. 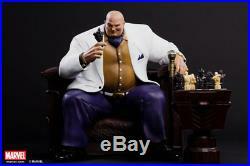 Tagged: authentic, kingpin, poster, premium, spider-man, statue. WE NEED EACH OTHER, DAREDEVIL. WE ARE PARTNERS AFTER A FASHION. WE ARE THE POWER IN THIS CITY. XM Studios is excited to present our next Marvel Premium Collectibles series statue, Kingpin! The criminal mastermind is immortalized in amazingly detailed 1:4 scale cold-cast porcelain. Each painstakingly handcrafted statue is individually hand-painted with the highest possible quality finish. True Marvel Comics fans know who this super villain is! A criminal financial strategist without parallel, XM is excited to present Wilson Fisk in a setting that says it all; Tactical Strategist, Rich, powerful and influential over the entire city. It’s all cleverly embedded into this stunning statue with all the relevant elements. 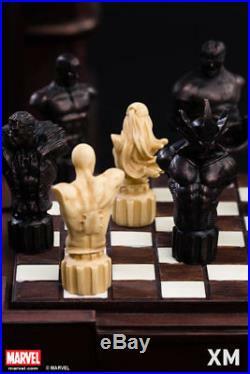 The exquisite couch design and carvings, the highly detailed chess piece board and pieces (pick which piece you want to place in his hand), the expensive jewelry the Kingpin wears and carries, the confident smirk – the story is right there. Perfect companion piece to XMs Spider-man, Elektra and Daredevil! Wilson Fisk, the man who would one day become the Kingpin, started out as a common thug in the Bronx. He was noticed by one Don Rigoletto, an accomplished crime boss who admired Fisk’s sheer brutality and hired him as his primary enforcer. Fisk eventually murdered his benefactor and took control over his mob empire. Thus, the Kingpin was born. Wilson Fisk is a criminal mastermind who is involved in extensive illegal activities such as drug running, smuggling, murder, and is a criminal financial strategist without parallel. Fisk has no superhuman powers, but the majority of his 400-plus pound bulk is solid muscle. He has employed any number of costumed criminals targeting his greatest enemies, Spider-man and Daredevil. 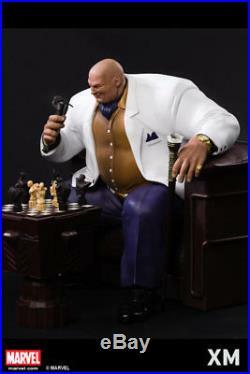 The Kingpin Premium Collectibles statue features. 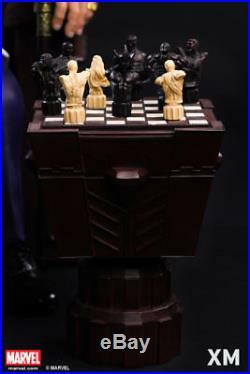 Chess piece Table with Ten (10) highly detailed chess pieces of Villains and Heroes. An exquisitely designed luxury chair with carvings of city scape on the back. Crafted from cold-cast porcelain. Art print by Studio Hive. Studio HIVE (Illustrator, Design and Concept Collaboration with XM Studios). David Pereira Ezcurra (Sculpt). XM Studios Design and Development Team. Manufactured by: XM Studios. Note: Prototype shown and pending final approval, final product may differ slightly. Product size : 38.5 cm H X 47cm L X 37.5 cm B. Box Size : 69.5 cm H X 48.5 cm L X 45 cm B. Product Weight : 14 kg. Package will be fully tracked, and insured at no additional charge. Ed may be revised LOWER than stated, but never higher. Track Page Views With. Auctiva’s FREE Counter. 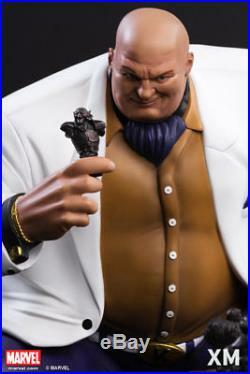 The item “XM KINGPIN Statue Premium! 100% AUTHENTIC WITH BOX! POSTER! Spider-MAN! 50″ is in sale since Thursday, February 08, 2018. This item is in the category “Collectibles\Comics\Figurines”. The seller is “primecardsandcomics” and is located in Regina, Saskatchewan. This item can be shipped to United States, Canada.